Happy Friday! Counting down to the end of the work day...does this speak to your heart too? I'm in the spring and nesting mood now that our weather has taken the nose dive into warm temperatures for good. I have taken it upon myself to lighten up some of the decor around the house by adding some lighter colored flowers here and there. Small changes can make a huge impact. Well, after reading plenty of reviews and looking at buyer photos, I opted to utilize my Prime membership and buy some faux flowers online knowing it is a breeze to ship them back if they look awful. But, they were a fraction of the cost of the ones I had been saving in my Wayfair cart online so I went with Amazon. I purchased these faux peonies in "spring hot pink" and in "light pink" for $10.99 per bunch and ordered these faux white peonies for $17.99 for 2 bunches. I truly enjoy putting together gifts and so does the FH. 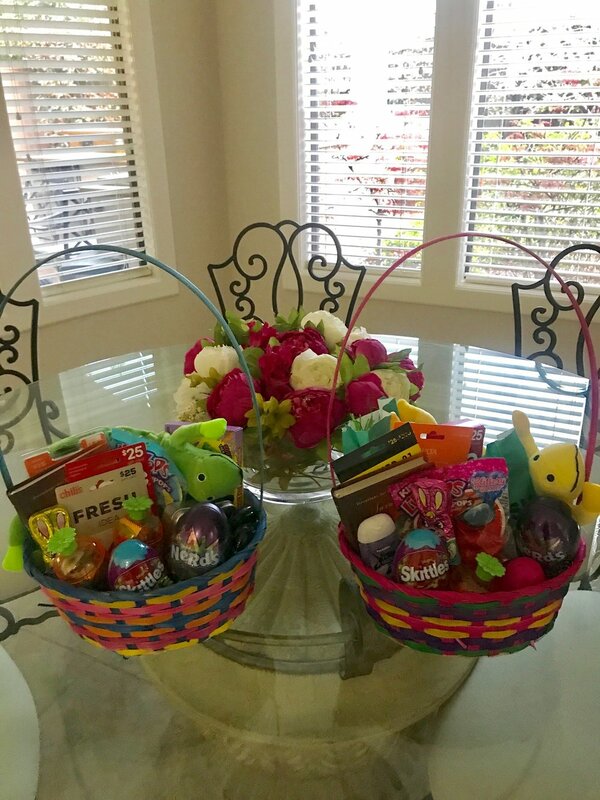 We decided to assemble some fun Easter baskets and even though the recipients are teenagers/young adults, it was still fun! Some items we included were various gift cards, candy (of course), bath bombs and other washes from Lush, dog toys, Bath & Body works hand sanitizers, and the Jesus Calling devotionals. You can check out my previous post with Easter basket ideas here. Healthy / semi - healthy treats & snacks. I utilized the Amazon Prime $2 sample option recently to try these "protein chips". They has an interesting texture, a bit more like a cracker than a chip, and a decent flavor. They're not a Whole 30 type of snack, just something gluten free, different, higher in protein, and low carb. Give them a try if you have the opportunity to especially with the Amazon samples option. They won't necessarily change your life with the experience, but they definitely can help get you through some cravings if you're having a weak moment. There are four flavors. This was the only flavor I could get as a sample. The neat thing is that the $2 you spend on a sample goes as a credit to your account if you end up buying the full size product (with any sample that is). Do you have any semi healthy treats you like to indulge in? If you missed my previous post where I mentioned the Amazon samples you can find it here. If there's one thing I'm a fan of, it's online shopping. I get so much accomplished this way while I'm not able to spend the time physically shopping in a store. If there's another thing I'm a huge fan of, it's bargain shopping...especially when it's something that will hardly be worn if even worn more than once. If you're going to a formal event soon or getting married soon - I suggest these earrings. I bought them in black for myself for a gala last year as well. And this is the bracelet! It's a stretchy cuff so will be easy to fit on most wrists. It's no secret that I'm a fan of riced cauliflower and riced sweet potato. Well, I discovered a couple months ago while ordering on Instacart that the Green Giant makes riced cauliflower and it's pure cauliflower, nothing else. I hadn't discovered this because I rarely ever walk through the frozen foods section. Well, now that I know I am on the prowl and recently discovered TWO additional healthy, Whole 30, Paleo, vegetarian, vegan, everything wins. Extra bonuses are 1) you do not have to clean up the little white pieces of cauliflower that inevitably get everywhere when you cut it and 2) it stays frozen until you use it so you can say so-long to wasting money on vegetables going bad. Can I get an #AMEN! I consider this a major win. I also did see riced carrots made by the local store's brand, but I haven't tried them yet. 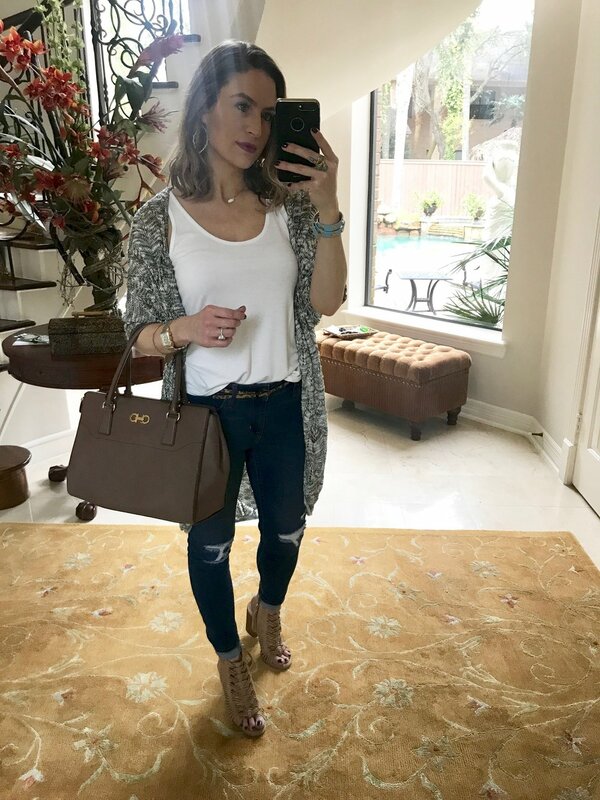 I'm all about long cardigans right now. I can't seem to break away from them. This one was purchased for a whopping $6 at mall in Lufkin, TX at a store I couldn't remember the name of if you paid me. But, these are the small victories I love so much. What were some of your favorite things about the week? Anything new to share? I am sure you're looking forward to the weekend too and if you're like me, then the short work week next week! Wishing you all, dear friends, a wonderful weekend.